In this article, we review 10 of the best hair clippers and trimmers currently available on the market, in the hope that you, too, can enjoy the benefits of this wonderful product. These clippers are all equipped with razor sharp blades and heavy duty motors that deliver power and performance without sacrificing comfort: you can be sure they will cut through any hair no matter how thick, quietly and smoothly. You can also use them to trim, clip and sculpt beards and mustaches, and clean up sideburns and necklines – they do it all. Some of these hair clippers are wireless and battery operated, others rely on AC mains power. However, they are all efficient at what they do, as well as being easy to handle and clean. Suitable for use by at home mothers who like to maintain their own family’ hair, as well as by professional barbers and hairstylists, hairdressing students and even animal groomers. These clippers have something for everyone. 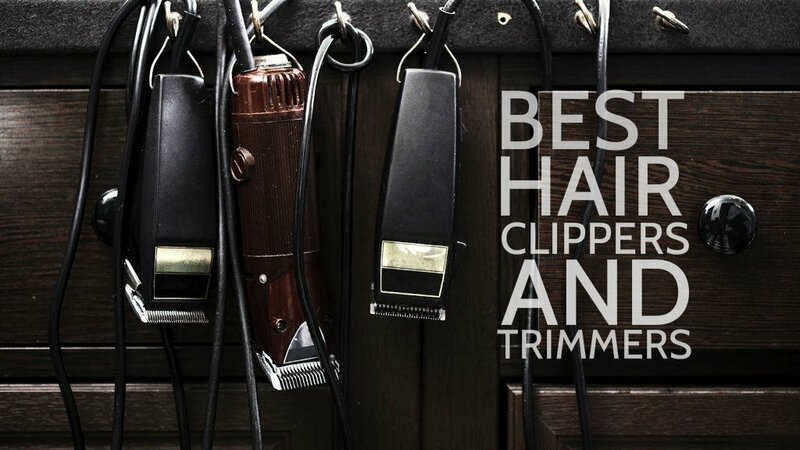 So without further ado, let’s look at some of the best hair clippers and trimmers out there today. If you want to perform professional standard haircuts from the comfort of your own home, then consider buying the Wahl Color Pro Complete Haircutting 20 piece kit. With this product, you get one MC clipper, powered by a heavy-duty magnetic motor that together with the clipper’s precision ground self-sharpening steel blades deliver powerful, clean cuts to all types of hair, including facial hair like beards. These hair clippers are specifically designed to be easy to handle with comfort grip feature so that they deliver a smooth, painless cutting experience for both the cutter and the recipient! What’s more, your hair cutter comes with an easily-adjustable taper lever that enables straightforward blending and customizable cutting lengths. And there are 11 differently sized guide combs, one for each of the different settings on the clipper, with a color code scheme on both enabling you to find just the right comb for any given setting – ensuring that you have just the materials you need to achieve a certain hairstyle or length. To protect the blade you get a plastic blade guard, whilst for the clippers there is a 6-inch storage case that has its own handle grip. Additional accessories included with this product include barber and styling combs, scissors, blade oil and cleaning brush to maintain your clippers, and instructions and styling guide. And it’s all backed by a whopping 5-year warranty, which really shows the confidence the manufacturers have in their product. So go out and grab the Wahl Color Pro Complete Haircutting 20 piece kit, everything you need for a memorable cutting experience is included right here, these are some of the best hair clippers around. 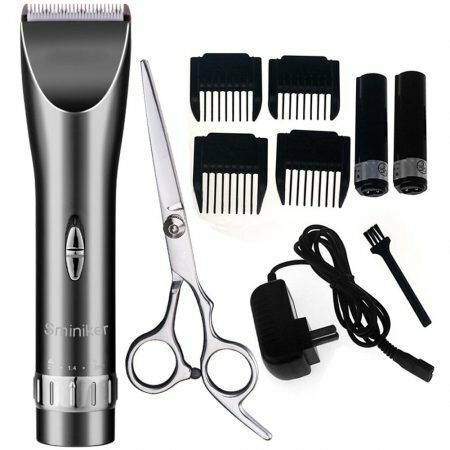 Professional standard hair cutting kit, these professional barber clippers are suitable for use by barbers and hairstylists, or for at home use it will deliver haircuts to all the family. MC clippers with heavy duty magnetic motor and precision ground self-sharpening steel blades, this hair razor will cut through even the thickest of hair cleanly and without painful dragging or pulling of hair, or split ends. Clippers come with comfort grip for easy handling; these hair trimmers provide a pain-free hair cutting experience to both the cutter and the recipient of the hair cut! 11 cutting settings controlled by easily adjustable taper lever, customize the cutting length of your clippers depending on the needs of the hair and switch easily between settings for better blending of hair. 11 differently sized guide combs, color coded to match the settings color code key on the clippers – thus enabling you to match the right comb to the right setting – ensures you have all the tools you need to cut a certain length of hair or achieve a certain hairstyle. Plastic blade guard protects the blade from damage and accidents. Clippers have their own storage case with handle grip. Backed by a 5 years’ manufacturer’s warranty. Clippers cut through any type of hair, just select the setting you require. 11 different settings/cutting lengths to choose from, easy to change mid-haircut. Clipper is very quiet when on. Color code scheme easily allows you to find the right sized comb for a given setting. Very easy to handle with comfort grip feature. Comes with its own storage case. Exceptionally attractive price point, for everything that’s included in the box. 5 years’ manufacturer’s warranty, a testament to this product’s quality. Some users report that the clipper are rather heavy and difficult to handle. According to other customers, the clippers do not really deliver a clean cut, dragging and pulling hair and damaging ends. No battery operated, cordless use. This Oster Pivot Motor Clipper is twice as powerful as your standard motor clipper, whilst being no more noisy or expensive. All that extra power means these men’s hair clippers will cut through even the thickest of hair, wet or dry, no problems. But at the same time, the pivot motor is whisper quiet, with your fast-feed clipper keeping noise levels down low while productivity stays unaffected. The steel blade is razor sharp and ultra durable, designed for ultra long lasting usage, and with included blade adjusting lever you can easily adjust settings and change the length of the cut. These hair trimmers will enable you to achieve whatever hairstyle you like; you can use it to shave, trim, and sculpt your beards and facial hair too. The ergonomic design and textured handle and housing allow for easy grip and a smooth cutting experience that doesn’t place undue stress on your back and hands – you can use this hair razor all day long. It comes with an 8-foot long power cord, giving you plenty of reach also. Among the additional features included with this Oster Pivot Motor Clipper are a free blade guard, lubricating oil for between use of the blade, 4 guide combs (blending, 1/4 inch, 3/8 inch, 1/2 inch), one cleaning brush, and instruction guide. This is another very good quality, affordable set of hair clippers, suitable for at home use and by professional barbers and hair stylists, go out and grab your set today. 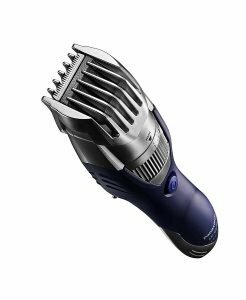 The Oster Pivot Motor clipper provides clean, even cutting and trimming of the head, beard, and facial hair, no dragging or pulling of your precious ends. Suitable for at home use or by professional barbers and hair stylists. One of the best hair clippers around. The Pivot Motor is Whisper Quiet yet two times as powerful as standard magnetic motors will cut through even the thickest of hair, wet and dry, no worries. Adjustable blade, can easily alter the length of the cut and achieve just the style you desire. Choose between close cut length, to medium. Texturized rubber handle and housing and ergonomic design for easy grip and all day cutting, no need to worry about undue stress to your back and hands. 8 feet long power cord, enables good reach. Additional equipment: one blade guard, 4 guide combs (blending, 1/2 inch, 1/4 inch, 3/8 inch), cleaning brush, blade oil, and instruction guide. Very powerful motor, twice as powerful as comparable magnetic motor clippers on the market, but with no extra noise. Lots of extra accessories included at no extra cost – these professional barber clippers are great value for money. No battery for cordless use. According to some consumer reviews, it’s not really Whisper Quiet as claimed – on the low setting at least, it actually makes quite a lot of noise. Parts need to be oiled regularly. No storage case or stand included. For an efficient, effective cutting experience that won’t break the bank either, consider this offering from Sminiker. This wireless hair cutter is suitable both for professional barbers and hair stylists. AND for those of you at home who like to cut you and your own family’s hair. The cordless hair clippers have a razor sharp titanium blade that won’t get blunt over time, it delivers a clean, even cut with no snagging, dragging or splitting of hair ends. The heavy duty, precision motor gives you power and performance, but without any undue noise and vibrations. You also get 5 comb guides (ranging from 3 mm to 15mm), so you can easily pick the length that’s required for the hair you are cutting: achieve just the hair style you want with these hair trimmers. Meanwhile, the heavy duty lithium battery provides up to 8 hours’ continuous use when fully charged – and has a charging time of only 2-3 hours. It delivers precision, power and, performance without sacrificing comfort and quietness. Other accessories included in the pack re: AC power adaptor, cleaning brush, and scissors. These hair clippers from Sminiker tick all the boxes, go out and give them a try, they’re highly recommended. Powerful and efficient professional barber clippers, deliver a clean cut every time – even to the thickest of hair. No need to worry about snags, dragging or splitting of hair ends. Suitable for use at home or in professional barber shops and hairdressers. Razor sharp, precision titanium blades, self-sharpening and built to last a lifetime. These are cordless hair clippers, they run on a heavy duty lithium battery, when fully charged (charging time: 2-3 hours) it delivers a whopping 8 hours of continuous usage. An extra battery also included. 5 guide combs, ranging in length from 3mm to 15mm, choose exactly the length you require to achieve the desired hairstyle. Mix and match for perfect blending. One power cord, 180 cm long. Included accessories: AC power adaptor, scissors, cleaning brush. Very powerful and efficient, but also quiet and free of vibrations etc – these clippers work like a dream. Attractive price point, great value for money. The battery has extremely long working time. No lubricating oil included, you will have to go out and buy your own. No storage case, or charging stand. Achieve just the look you want for your hair with this Remington 15-piece Barbershop Kit. With their superior quality, heavy duty ‘super magnet’ motor, and razor sharp steel blades that deliver a clean, even cut, free of snags, painful pulling and dragging of hair, and with NO undue noise and vibration – these hair clippers will do it all. There are also 8 guide combs to choose from, giving you plenty of options for achieving just the style of head or facial hair you desire. With its tough casing, ergonomic and rubberized grip, these hair trimmers also deliver a smooth, pain-free cutting experience for the user as well as the recipient of the cut. Remington offers you a range of additional accessories with this product, including storage case, barber’s scissors, cleaning brush, cape, blade guard and oil case. The 8 foot long, industrial strength power cord, will offer you plenty of reach with this hair razor too. Everything you need for a fantastic hair cutting experience is included right here with Remington’s hair clippers, and it’s all backed by a lifetime warranty – a testament to the confidence the manufacturers have in their product – a confidence you should share also. Remington’s 15 piece ‘Virtually Indestructible’ Barbershop Kit will deliver you a memorable haircutting experience, whether you are a professional barber or hair stylist, hairdressing student, at home mum, or even dog groomer. Cuts through even the thickest hair, no dragging, pulling or split ends. Comes with Heavy Duty Super Magnet Motor that delivers power and precision without sacrificing comfort. Indeed, these clippers make virtually NO noise and unwelcome vibrations. Stainless steel precision blade, razor sharp and built to last, it will cut through even the toughest of hair, again and again, and again. 8 Guide Combs to choose from (ranging from 3 mm in length to 24mm): choose just the length you need to achieve the desired hair style. The tough outer casing that won’t deteriorate over time, with rubberized grip and ergonomic design – these electric clippers are super easy to handle, will deliver a smooth, comfortable cutting experience as much for the user as the recipient of the haircut. 8-foot long power cord gives you plenty of reaches; it is also industrial strength, so you will get years of usage out of it. Included accessories: storage case, blade guard, cleaning brush, barber’s cape, oil bottle. Lifetime warranty, a testament to the faith the manufacturers’ have in their product. An attractive price point for what’s included in the box, great value for money. Easy to grip and handle, very little noise or vibration. Cuts really smoothly, no dragging, pulling or splitting of ends. Easy to open up and clean. According to some users, it gets uncomfortably hot after only a few minutes usage. The design is a bit lightweight and flimsy. 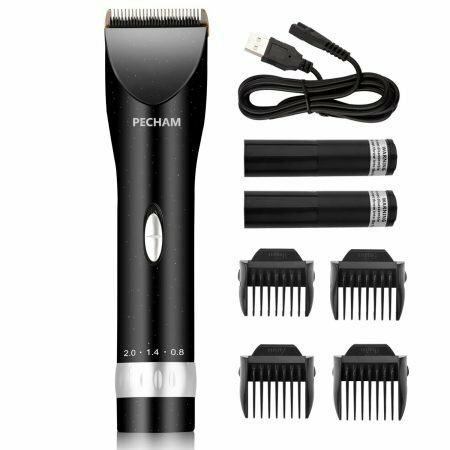 This PECHAM cordless hair clippers will deliver you a smooth hair cutting experience, it’s equally suitable for use at home or in a professional barber shop or hair salon. Use the hair cutter to cut your hair, trim your beard, and clean up sideburns and necklines. The heavy duty magnetic motor and self-sharpening blades will deliver a clean, even cut with no dragging, pulling or splitting of hair ends. There are 4 guide combs to choose from, ranging from 3 mm to 9 mm, choose just the length you require to achieve the desired hair style. Meanwhile, the battery will deliver up to 8 hours’ continuous usage (with only 2-3 hours’ charging time), the hair trimmers come with a USB port for convenient charging as well, ideal for traveling. The indicator light on the Clippers shows the charging status of the battery. All in all, this is another fantastic hair clipper option from the folks at PECHAM, a great way to round out this list. Professional standard electric clippers, use them to cut your own or your family’s hair, trim beards and mustaches and clean up your sideburns and necklines. You can even use them to groom your pets. They are suitable for use at home or in professional hair cutting settings like barber shops and hair salons. With razor sharp, stainless steel blade and heavy duty magnetic motor, these clippers will deliver a clean, even cut every time, even on the thickest hair. No need to worry about painful and uncomfortable dragging, pulling of hair and splitting of your precious ends. Comes with 4 guide combs, ranging from 3mm to 9mm, adjust the length to achieve just the style of hair you require. Easy to grip and handle, no unnecessary noise or vibrations. Powered by a lithium battery, these cordless hair clippers deliver up to 8 hours’ usage on a full charge (charging time: 2-3 hours). Indicator light shows the charging status of the battery. Comes with USB port and cable for convenient ‘on the go’ charging, these clippers are ideal for taking traveling with you. 100% money back guarantee, ‘no questions asked’, and 12-month manufacturer’s warranty. Works really well, according to most consumer reviews, very smooth and quiet. USB port and cable for convenient charging, ideal for traveling. Easy to clean, fully waterproof as well. Up to 8 hours’ wireless working time. Works just as well powered by the battery, or by plugging into any standard power outlet. Nifty charging indicator light feature. No lubricating oil provided will have to go out and get your own. 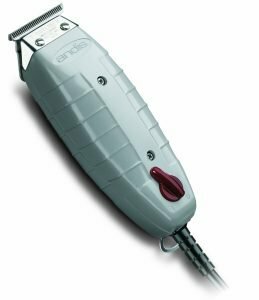 For a set of ‘all in one’ hair clippers and trimmers that will deliver clean, precise cutting, trimming, shaving, and general clean up of hair, sideburns, beard and hard to reach facial hair, and all without breaking the bank, consider this T-Outliner Trimmer from Andis, it is a product like no other. With its heavy duty, high-speed magnetic motor, this hair cutter provides a cutting experience that delivers power, speed, and control, but without sacrificing comfort – yes, despite their power these clippers make NO noise and vibrations. The premium quality carbon-steel blades with fine cutting teeth provide exceptionally close cutting and are built to last a lifetime. You will get literally hundreds of cuts from these clippers. The blades of this Andis’ T-Outliner Trimmer can be adjusted with ease also. And these hair trimmers are equally as comfortable for the user as they are for the recipient of the cut. They contain contoured housing for ease and comfort of handling, and a heavy duty 8 feet long power cord which gives you maximal reach and versatility. For an all around fine cutting experience, suitable for use at home OR in professional barber shops and hair salons, consider this T-Outliner Trimmer from Andis, it is one of the best hair clippers of its kind out there. Professional standard T-Outliner Trimmer can be used to cut your own family’s hair at home but will be just as at home with professional barbers and hair stylists. Carbon steel T-blade with fine cutting teeth, easily adjustable – will cut, clip, trim and shave hair, beards, sideburns – you name it, this hair razor will do it. Contains heavy duty magnetic motor that performs cuts with power, speed, and versatility, whilst at the same time is quiet and vibration-free. Cuts hair wet or dry, especially suited to performing dry shaves. Blades can easily be adjusted for customized cutting experience. Easy and comfortable to use and handle, with contoured easy to grip housing. Comes with 8 feet long power cord supplying greater reach and versatility of use. Very effective hair clippers for men, fine teeth blade give a really clean cut. 8 feet long power cord gives greater reach. Works best on short hair, not so effective at cutting long hair – the blades are quite short after all. Only a few settings, not as many options as some other products reviewed here. No battery powered, cordless use. 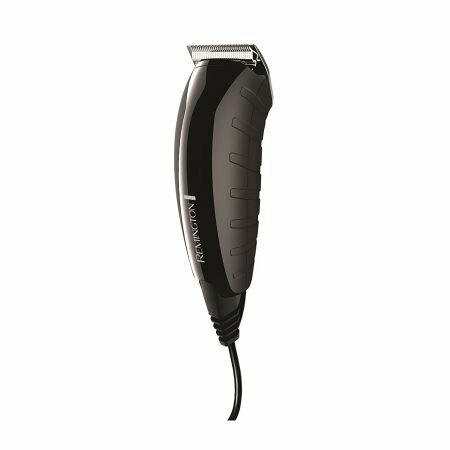 When purchasing the Panasonic ER-GB40-E 19 Hair and Bear Trimmer for men, you can be sure this product will deliver a clean, precise cut or trim every time. It’s super-sharp, stainless steel blades are set to a 45 degrees angle to ensure optimum reach and cutting, and it comes with 19 precision adjustable length settings – ranging from 1 mm to 10 mm – so you choose just the cutting length you want depending on the effect you want to achieve. Simply adjust the trimmer dial on the handle. Speaking of which – the Panasonic trimmer handle is easy to grip with an ergonomic design that ensures no undue stress on your back and hands. These hair clippers provide a comfortable, pain-free experience both to the user and the recipient of the cut/trim! The Panasonic trimmer is battery operated and thus these are cordless hair clippers, though it can also be plugged into the wall if you want longer use (charging stand also included). It is fully waterproof as well, so use it on wet hair as well as dry, take your hair clippers for men with you in the shower, and clean it easily simply by placing under running water. A cleaning brush is also included for cleaning the blades. 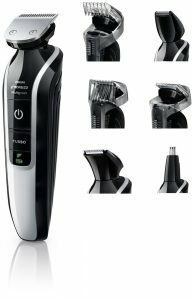 If you want a product that will allow your man to quietly and effectively clean up and maintain his beard for many years to come, you can’t go past the Panasonic Er-GB40-19 men’s hair clippers, it is pure quality. Male hair trimmers and beard trimmers that deliver a smooth, clean cut. Use these professional barber clippers for standard shaves, to clean up your sideburns, or to maintain and style/shape your beard. Super sharp stainless steel blades, set to 45 degrees angle, the optimal cutting edge – this hair cutter provides quick and efficient cutting and trimming every time. 19 precision length settings – ranging from 1 mm to 10 mm – choose the one that best suits your requirements, whether you want to cut or trim your beard, style or sculpt it, etc. Super easy to grip rubber handle with an ergonomic design that won’t place undue stress on your hands or back – these mens hair clippers are just as comfortable and pain-free for the user as for the recipient of the cut. Use your hair clippers for men anywhere – cordless – or plug into a power outlet for charging and longer use. The battery is a Ni-MH type, charges in one hour and supplies 50 minutes of wireless use to these cordless hair clippers. Waterproof, you can use these mens hair clippers on wet hair as well as dry, take it with you under the shower, and clean it under running water. This hair razor also comes with its own charging stand, which lights up red whilst charging and provides for secure storage of the hair trimmer when it is not in use. Cordless means you can use these men’s hair clippers anywhere also charges quickly and effectively. Waterproof and shower friendly electric clippers. Charging stand doubles up as a convenient place to store trimmers when not in use. 45-degree angle blade provides optimal cutting, reaches the corners other trimmers can’t. 19 adjustable length settings, lots of options with these trimmers. Apparently, the blade needs to be oiled before each use! This wouldn’t be necessary if the parts were of better quality. Achieve exactly the style you crave with the Philips Norelco Multigroom 5100 All in one Trimmer. With this ‘all in one’ multi-groomer you get 7 tools; apart from the main electric clippers, you also get a beard, stubble and hair clipping combs; nose and detail trimmers; and a mini-foil shaver. The main trimmer comes with finely ground stainless steel self-sharpening blades that are built to last, and rounded blade tips that are skin friendly and prevent rashes and irritation. There are also 18 length settings to choose from merely by turning a dial, allowing you to choose any hair or facial hair style you like, and a turbo-boost feature for fast results on even the thickest of hair. This Philips hair cutter is cordless, you can also plug it into the wall and use it; the lithium-ion battery also charges fully in one hour, and provides 60 minutes’ cordless coverage in one go. It is also waterproof and easy to clean, just rinse under water (you can also take it into the shower with you). Finally, the Philips Norelco Multigroom 5100 All in One Trimmer comes with a 45-day free trial and is backed by a two years manufacturers’ warranty. Go out and grab your set of Philips hair clippers today; not only is this a risk-free investment, but it comes with all the mod cons and ticks all the boxes you are looking for in a trimmer/clipper. ‘All in one’ trimmer comes with 7 different tools for the ultimate versatility in head and facial hair styling: with this purchase, you get full-size trimmer; hair clipping, beard and stubble combs; detail and nose trimmers; and mini-foil shaver. All the features included make it one of the best hair clippers on the market. The full-size trimmer contains a powerful magnetic motor, and razor sharp self-sharpening chromium-steel blades and guaranteed long-lasting performance; the rounded tips of the blade provide for a skin-friendly shave with no need to worry about rashes or skin irritation. You get 18 different lengths settings (1mm to 18mm), adjust with the mere turn of a dial. Create just the hair and beard style you please with these hair trimmers. Press the included Turbo power button for trimming really thick hair; it does the job cleanly and evenly. Battery-operated, cordless hair clippers, can plug it in to use and charge as well. Lithium-ion battery, charges in one hour, provides 60 minutes of cordless use. Waterproof: can use wet or dry, wash it under water, take the trimmer into the shower with you. Free charging stand included as well. 45-day free trial and 2 years’ manufacturers’ warranty. A Very attractive price point for what’s included in the pack – 7 different tools. 18 different length settings, allows you to achieve just the hair style you want. Turbo boost option for extra thick hair. Very quiet as well despite its power. The charging stand is made from cheap plastic. Some users report that the razor dies after less than a year of usage. 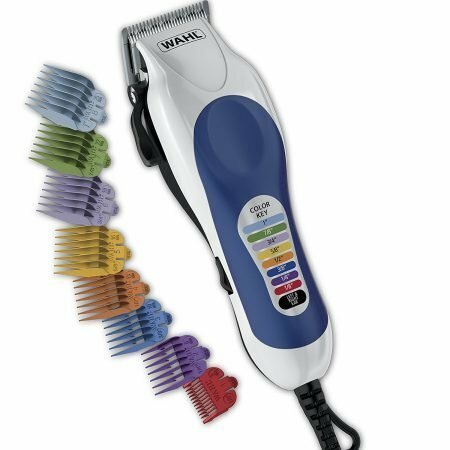 The Wahl 79600-2101 cordless hair clipper has it all; the main, multi-cut clipper has a heavy duty motor, twice as powerful as standard Wahl motors, and includes razor sharp, self-sharpening precision blades; together they will cut cleanly through all types and thicknesses of hair, no snags, and won’t become blunt over time. And it comes with a full set of guide combs (14) allowing you to achieve any number of different hairstyles and lengths with these clippers – the possibilities are endless. There is even a special detail trimmer, ideal for sideburns and necklines. These hair trimmers from Wahl are battery operated, the battery is lithium-ion, it charges in 3-5 hours, and provides 2 hours’ working time. It’s able to hold a charge for up to a year also – these are some truly durable batteries. Other accessories included with these professional barber clippers: blade guards, storage case, hair clips (x 2), barber and styling combs, blade lubricating oil, scissors, cleaning brush, barber’s cape, left and right ear tapers, eyebrow, and ear trim guides, guide combs AND full-color instructions. 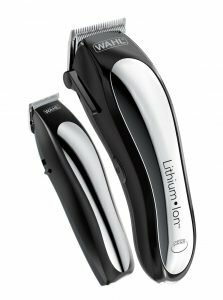 These Wahl 79600-2101 hair clippers come with all the mod cons, this product is GREAT value for money. Go out and grab YOUR set today, this hair cutter is suitable for use by professional barbers and hair stylists, and for the at home ‘amateur’ hairdresser. Premium quality and versatile men’s hair clippers, suitable for all types of hair lengths and desired hair styles. Can be used at home, or in professional barbers and hair salons. Multi-cut electric clippers come with heavy duty motor, twice as powerful as standard Wahl motors, and razor sharp self-sharpening precision edged steel blades, provide efficient, clean and snag-free cutting. Also durable and built to last a lifetime. These are cordless hair clippers, run on a lithium-ion battery with 2 hours working time, 3-5 hours’ charging time. Holds a charge for up to a year of no usage. Also, has 15 minute ‘quick charge’ feature, delivers 12 minutes of power. Detail trimmer also included (runs on 2 AA batteries), ideal for necklines & sideburns. A broad range of guide combs (14 in total), allows you to achieve whatever lengths and hairstyles you please. Other accessories: storage case, blade guards, hair clips (x2), barber and styling combs, lubricating oil for the blades, cleaning brush, barbers cape, scissors, left and right ear tapers, eyebrow and ear trim guides, full set of guide combs, and full-color instructions. With all the accessories included at very little additional cost, this is surely one of the best hair clippers out there. Battery operated, short charging time, long working time. Works great, delivers powerful, efficient, clean snag-free cuts. 14 guide combs, you can achieve a vast range of different lengths and hair styles with these clippers. Detail trimmer also included, at no extra cost. Loads of accessories, great value for money. ‘Instant charge’ feature comes in handy when the battery unexpectedly goes flat. The head is not removable, you can’t take it off and clean out the inside – can only blow the debris out. Not much lubricating oil supplied will have to go out and buy your own. The scissors supplied are very cheaply made. Batteries not included for the detail trimmer. The Braun Cruzer 5 Hair Clipper will efficiently trim, clip and cut any type of hair, head or facial, you care to name. 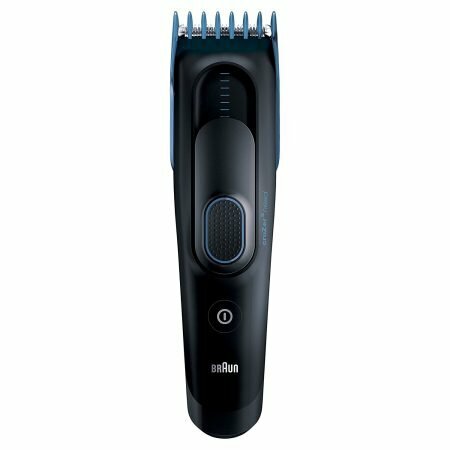 It contains a heavy duty dual battery system, and razor sharp stainless steel blades, that together deliver power and performance that doesn’t sacrifice quietness or comfort – these clippers will cut through even the toughest of hair without dragging, pulling or splitting your valuable ends, making this Braun product one of the best hair clippers around. There is one trimming comb, whose length can easily be adjusted letting you achieve just the hair style and effect you require. These hair clippers are exceptionally easy to handle also, and the rechargeable battery supplies up to 40 minutes of cordless clipping, with a charging indicator included to show how much power remains. Braun’s Cruzer 5 hair cutter is full waterproof as well, which means you can take it with you under the shower, and easily clean under running water. This package also includes a cleaning brush, hair clipping comb, lubricating oil for the blade, and charging cord. Finally, you get a Memory StyleLock feature that ‘remembers’ whatever settings the clipper last used and keeps them firmly in place throughout the cut to ensure a regular, even result. Go out and give the Braun Cruzer 5 Hair Clipper a try, it is another high-quality hair razor option, suitable for use at home or in professional barber shops and hair salons. Efficient and effective hair clipping tool, these professional barber clippers will cut through even the thickest of hair without causing snags, or split hair ends. Suitable for use at home by those of you who like to maintain your family’s hair, and in professional barber shops and hair salons. Razor sharp, adjustable, stainless steel blade will cut through even the thickest of hair, no worries. Adjustable trimming comb, choose from multiple lengths and achieve just the hair style you desire. Heavy duty dual battery delivers power and performance without sacrificing quietness, comfort, and control. Easy to grip and handle, with an ergonomic design using these hair trimmers is a breeze. Rechargeable battery, 40 minutes’ cordless use. Charging cord – and if you want to save battery power, you can also plug it in and use it. Water proof design, take it into the shower with you and wash it under running water without fear of damage. Other accessories: hair clipping comb, cleaning brush, lubricating oil. Sharp blade and dual battery system, together deliver clean, powerful cutting. Battery powered, you get 40 minutes of cordless use before it needs to be charged again. Waterproof, can take it into the shower with you, clean it under running water – no need to worry about water damage. A lot of other accessories included – this hair razor is great value for money. International voltage supported (simply take adaptor plugs along with you when you go traveling). A power cord is also interchangeable with other Braun devices and products. According to some customers, as a face razor, this product does not work very well and does not provide a genuinely clean shave. Trimming comb is also very flimsy and poorly made. No protective storage case or charging stand included. In this review article, we have looked at some of the best hair clippers currently available on the market. As we have seen, these clippers are a wonderfully versatile and useful little product, most of the products reviewed here come with all sorts of nifty little accessories as well. We hope you find this article useful, and that it assists you in finding the right set of clippers for your needs so that you personally can begin enjoying all the benefits of these clippers yourself. Happy shopping, and happy hair cutting!